Looking for a fun way to help your Kindergarten, 1st Grade, or 2nd grade homeschooler practice their subtraction facts. Here are some FREE Toy Story Subtraction Flashcards to help with subtracting numbers 0-11. These are not an officially licensed product. The characters are inspired by Disney’s Toy Story. Whenever we add a splash of Disney fun, learning seems to happen more effortlessly at our house. So to help my Kindergarten, 1st grade, and 2nd grade homeschool kids I created these Toy Story inspired Subtraction Flashcards. 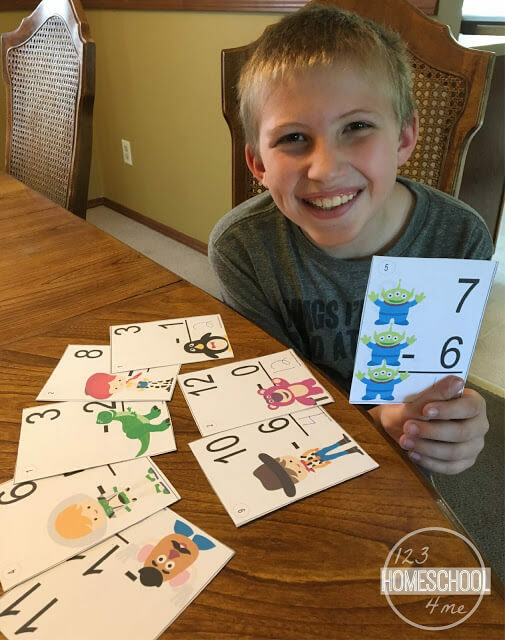 Help kids gain math fluency with these free printable subtraction flashcards with a fun Disney Toy Story inspired theme! These can also be used in many games. I highly suggest printing in color on cardstock 2-sided. For your convenience, on the back of each flashcard is the answer in the upper left circle. Clipart purchased and used with permission from REVIDEVI.